Our Dahlia 1 Carat Round Cubic Zirconia Slit Dome Pave Solitaire Ring is a dramatic and unique ring. 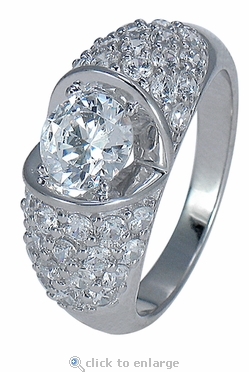 A 1 carat 6.5mm round is prong set and presented in a setting that appears to open up to reveal the center diamond look cubic zirconia stone. 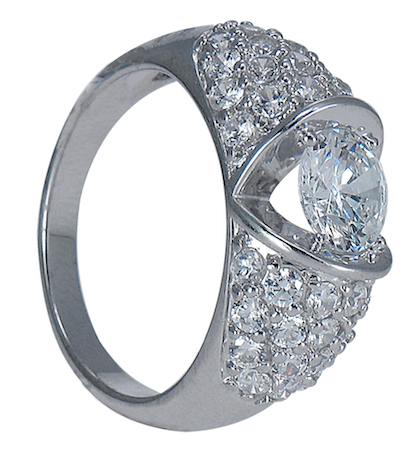 Additional pave set round diamond quality cubic zirconia stones encrust both sides of the shank. 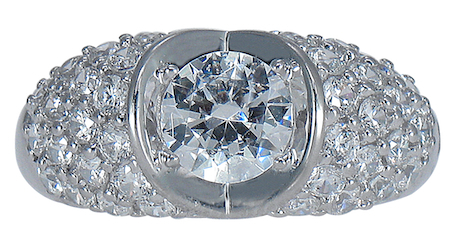 This ring can be worn as both a solitaire as well as a band, all in one. The band measures approximately 7mm at its widest point and includes approximately 3 carats in total carat weight of the finest Russian formula hand cut and hand polished cubic zirconia available. You can have this ring custom made in 14k white gold, 14k yellow gold, rose gold, 18k gold or platinum.